Excess water can mean major damage for your home especially if not handled properly. Flooding is on the rise, especially in Coastal areas. Every year it causes millions of dollars worth of damage in the United States. Excess water in the home, whether it comes from a major storm, a season of excessive rain or a burst pipe, brings with it a host of problems. Chief among these is the potential for mold growth. The effects of mold vary from person to person from cold-like symptoms to severe reactions to nothing at all but it’s always best to treat the potential of mold with due concern. For this reason, it’s important to get your home dried out and back to a safe place as quickly as possible. If water has been standing for more than 48 hours concern of mold grows. Do you live in a flood prone area? There are certain rules that apply when rebuilding in coastal areas and other flood prone areas. While most homeowners will not know the ins and outs of these regulations, getting up to speed now can save in unnecessary delays or costs. Contact your local building code authority and discuss with your contractor to ensure that all work is in compliance. The Centers for Disease Control and Prevention (CDC) recommends removing all porous items, such as carpet, upholstery, drywall and ceiling tiles that have been wet for more than 48 hours and cannot be thoroughly cleaned and dried. These items can remain a source of mold growth and could pose a health threat. Always wear proper protection when removing these items to avoid any potential health risks. If a home has flooded and been closed up for several days, it is very likely there is mold in the home. Upon re-entering the home for the first time, open windows and doors to allow the house to air out for 30 minutes or more to reduce exposure to mold. If an area larger than ten square feet is affected, the U.S. Environmental Protection Agency (EPA) recommends hiring a qualified mold remediation specialist. Disaster areas often draw large numbers of contractors from out of town or out of state. In most instances these individuals are just trying to extend a hand to those in need but unfortunately that is not always the case, so exercise caution. Search customer review websites or use online tools such as our Find a Pro tool, which allows homeowners to easily locate credentialed contractors based on zip code. Also, see point number one. If your chosen contractor is not from the area, make sure he or she is up to date on the local building code. Now more than ever it is important to understand the storm threats in your area and select materials accordingly. For example, vinyl or polymer siding will stand up to the weathering effects of sea salt spray. Certain roof and fence products are backed by wind warranties of up to 110 miles per hour or more. Select insulation and drywall materials that have mold and moisture attributes, while not designed to withstand submersion (like in the case of a flood), they are better suited to areas with high-moisture levels. 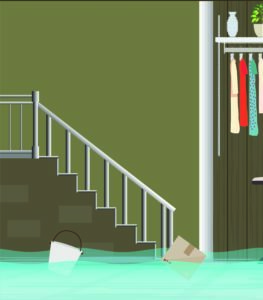 When dealing with water damage, whether it’s caused by the storm of the century or a burst pipe, the key to limiting damages and returning life to normal is to act as quickly as is safely possible. Looking for a qualified contractor in your area? We can help. Plus, how to repair drywall and time to get the insurance company involved? Here is what they’ll want to see. chance (stumbleupon). I have book marked it for later!